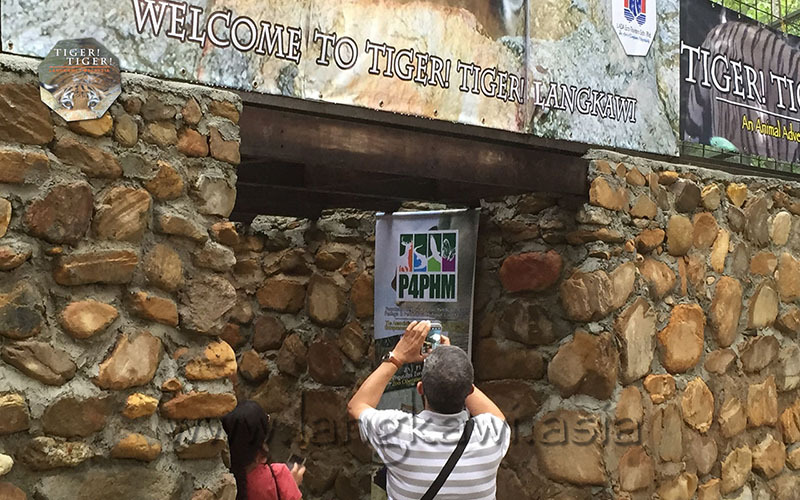 Nestled in a secondary Geoforest Park of Machincang and the Oriental Village is the all-new Tiger! Tiger! Langkawi, which relocated to these new grounds in July 2015. As with the original Tiger! Tiger! Exhibit & Gallery (February 2010-April 2014), Tiger! Tiger! 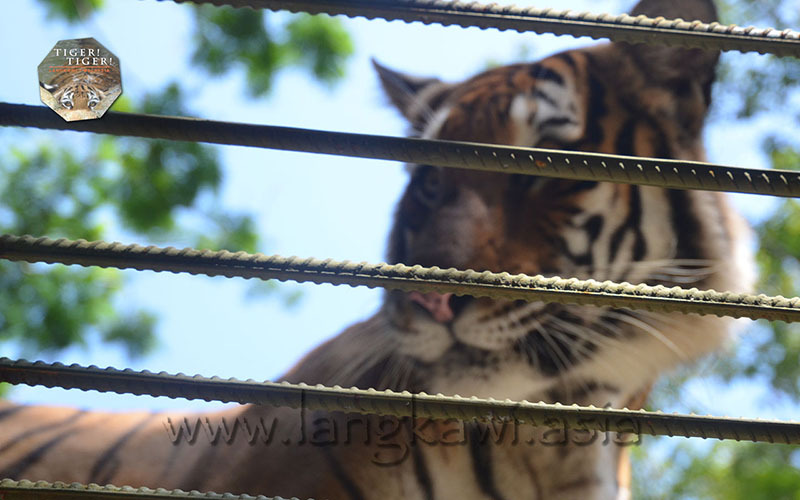 Langkawi remains a privately funded Malayan Tiger interpretive center. However, due to an increased operating and redevelopment costs, entry ticket/charges apply. While conceptualizing the new tiger exhibit for Zanah, we attempted to segregate the popular elements of our original but small adventure. 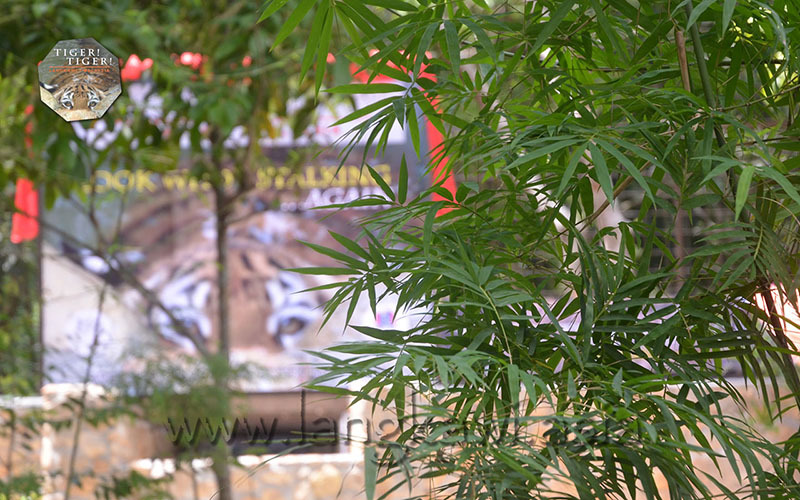 Firstly, we felt a need to segregate visitors who just wanted to view tigers from those who wanted to enjoy the "best coffee on Langkawi" (served by Bolaven Cafe Langkawi). Secondly, there would be husbandry requirements. This was followed by a stretch where guests could view the tiger from an elephant's top. Finally, but not least, we needed a lobby to receive guests as well. After we allocated two "sides" each to the cafe, public viewing and husbandry areas; and one side each for the elephant-top views and reception. the octagon-shaped enclosure was born. As the octagon––or "patt-kuah"––is an auspicious feature to Asians and that it tied in very well to "the Oriental Village," we decided to make it a recurring feature. 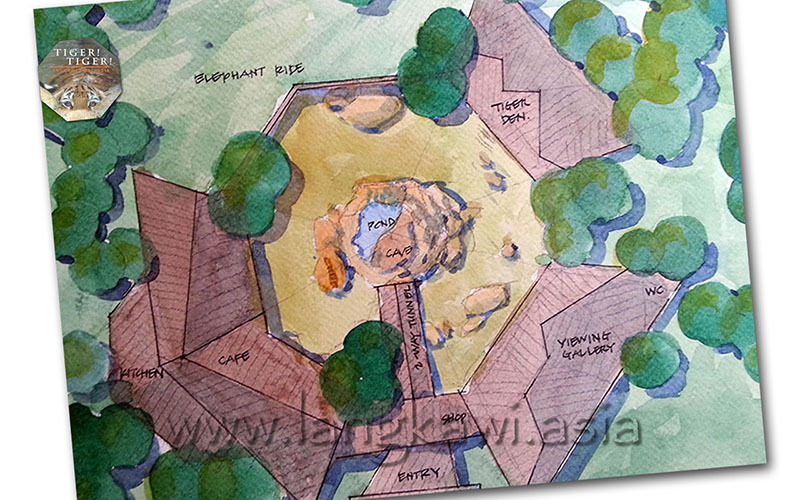 Visitors will notice the octagon recurring almost everywhere from wash basin areas,, an elephant holding platform, drainage sumps, Zanah's pool and, of course, Zanah's enclosure. As at the time of this update, we feature a Malayan Tigress in a unique but auspiciously-shaped octagon exhibit with multiple perspectives of the tiger. 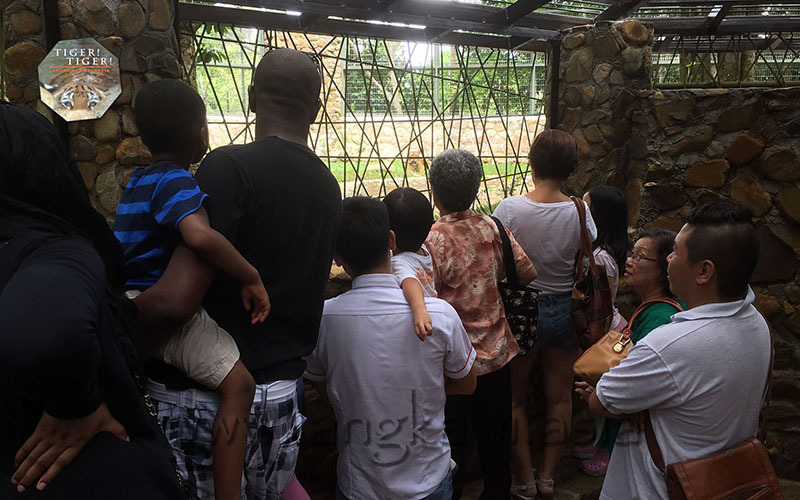 Each visitor is accompanied by our park rangers who brief guests on the Malayan Tiger and of Zanah's own story. Another recurring feature at the Park is the preservation of the flora here. While secondary forests don't feature many large trees, these grounds do feature some interesting trees including the tree pictured below that had "cork-screw" markings on its bark. 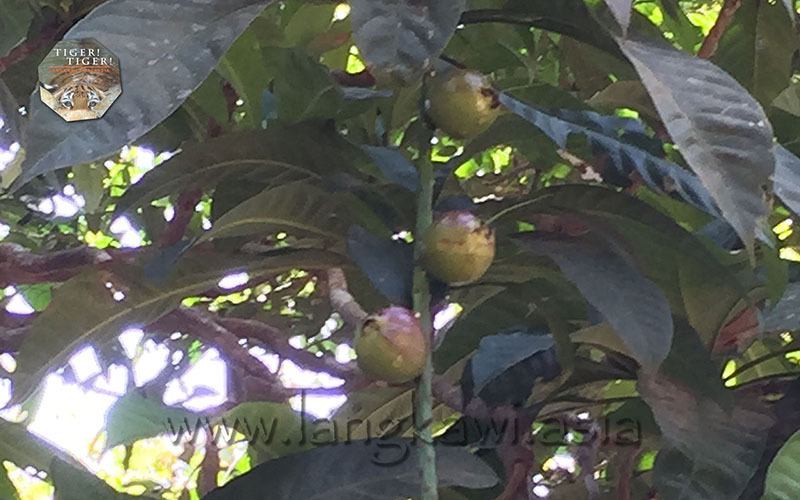 Some of the trees preserved in and around Zanah's compound include a wild mangosteen tree, a young jackfruit tree and fig trees. 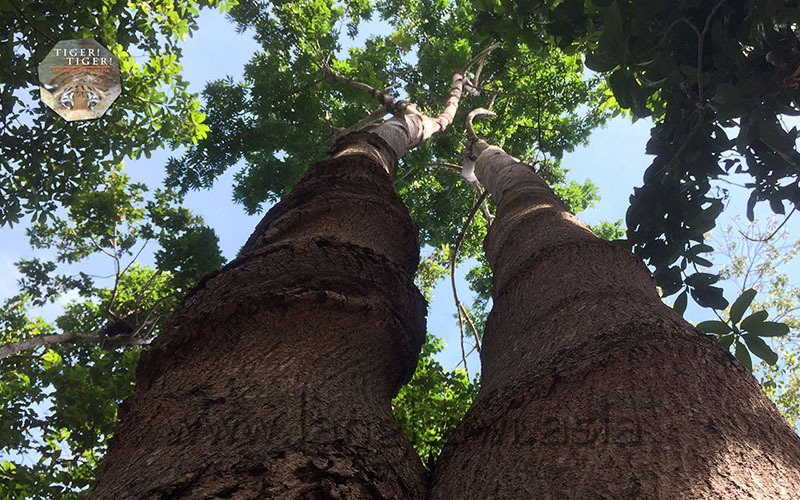 By preserving these trees and the transplanting of more than 1,500 plants from our previous elephant riding operation, we hope to ensure that these grounds remain a sanctuary to the many animals, birds, reptiles and insects that call these grounds "home." We are happy to report that hornbills, leaf monkeys, skinks and a variety of insects (including beetles and butterflies) continue to flourish on these grounds. 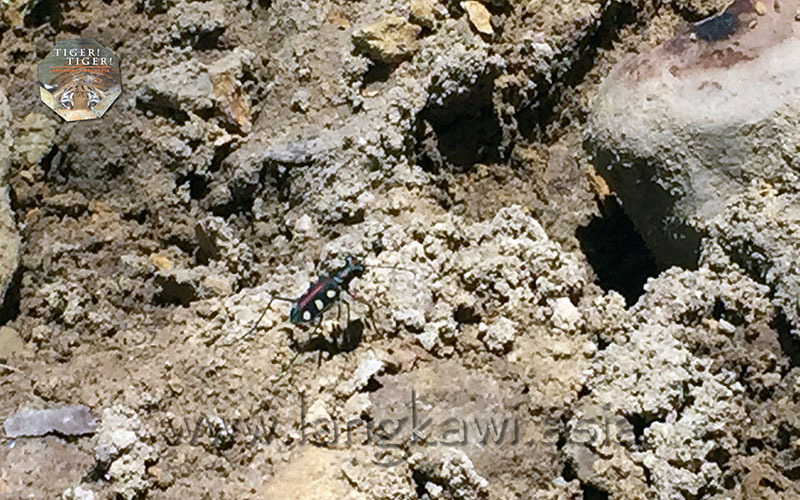 Interestingly, Zanah's exhibit and its surrounding areas are also home to the Tiger Beetle, the fastest beetle in the world. During initial earthworks, we discovered that as much as 50% of the soil comprised rocks! 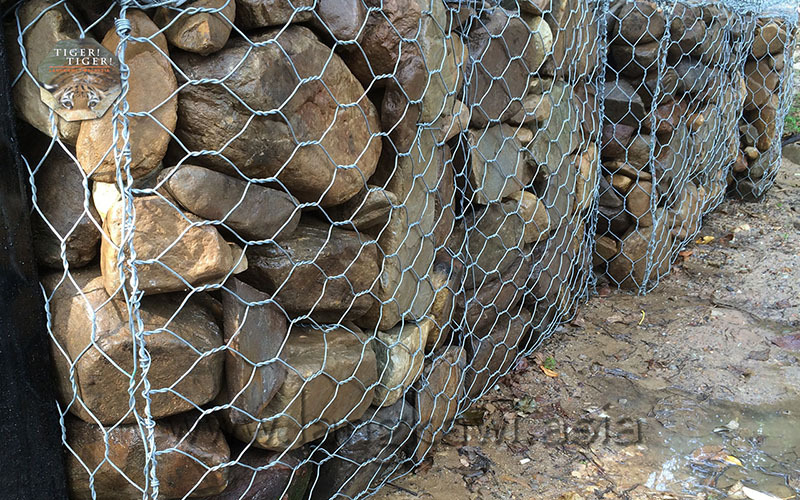 In fact, there was an abundance of rocks that we first used them in Gabion Walls, before deciding to incorporate them into Zanah's enclosure walls (as a base). These sand rocks are essentially as old as Gunung Machincang himself; hence "an Animal Adventure 550 Million Years in the Making." And why not? 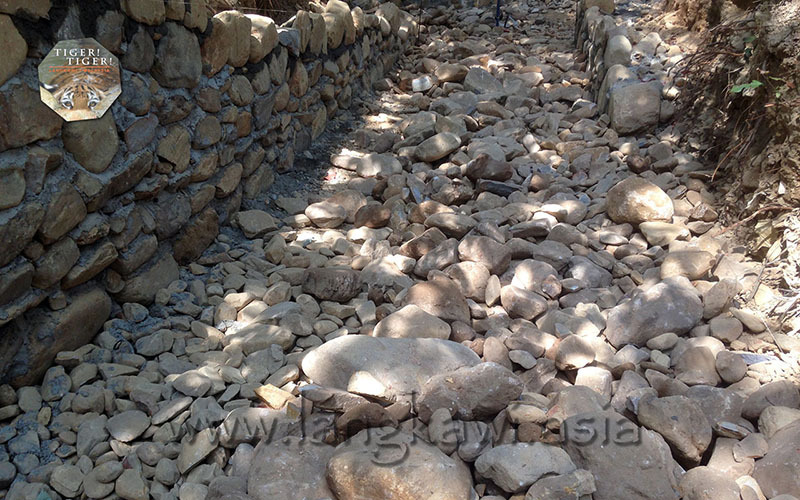 When rocks were not a part of the other structures, those structures were build with timber on a steel frame. These approaches make our structures reclaimable or that they may be returned to the ground, albeit with some concrete attached to it. May it be appropriate to point out the the cement is a Langkawi product too? 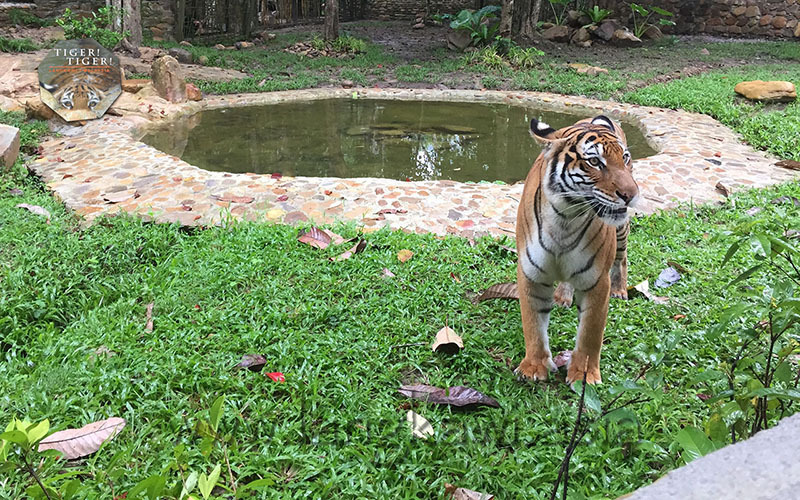 After seven months of letting Zanah's enclosure concept evolve from an octagonally shaped structure to one that featured Langkawi rocks prominently, Tiger! Tiger! 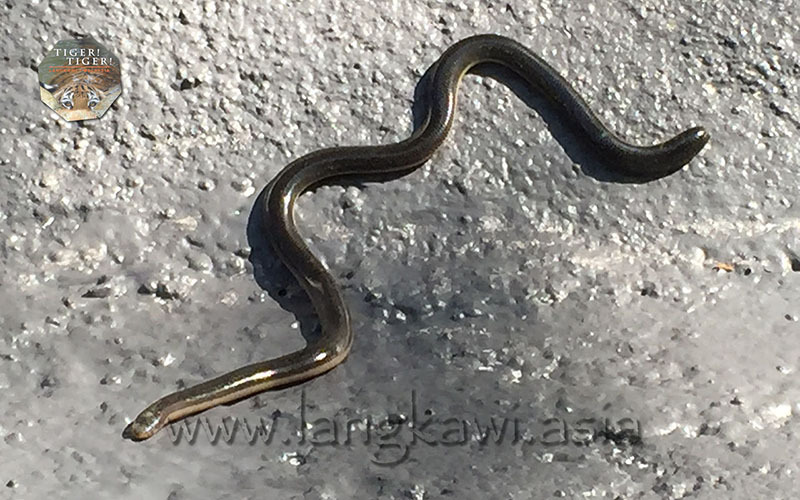 Langkawi finally reopened to public previews on July 15, 2015, albeit partially. Tiger! Tiger! Langkawi at the Sanctuary continues to be a works-in-progress but is safely accessible to guests, including those in wheelchairs. One of the unique features of our tiger exhibit is sub-terrain access to a central viewing area (seen above). This feature may not be as unique as other zoos may feature similar concepts. However, we decided against covering the top of the access tunnel with concrete because of the great views of the trees and skies above. And from time-to-time, depending on how lucky you are that day, guests may actually catch a tiger above them glaring down at them..
Sub-terrain Access to Tiger! Tiger! Langkawi Is that Zanah Above? Oh, Yes! When fully completed, Tiger! Tiger! 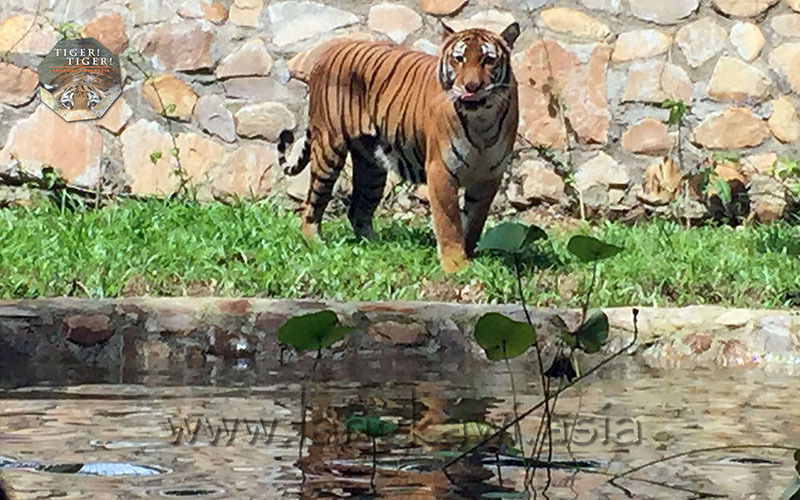 Langkawi will be one of the more unique tiger enclosures in the country giving guests a different but exciting tiger encounter! Entry to Tiger! Tiger! Langkawi is by way of entry tickets. These entry tickets may be purchase at the entry to Animal Adventures (Langkawi) from as little as RM10. Tickets will also grant visitors access to feed Lasah, the resident elephant at the Park. 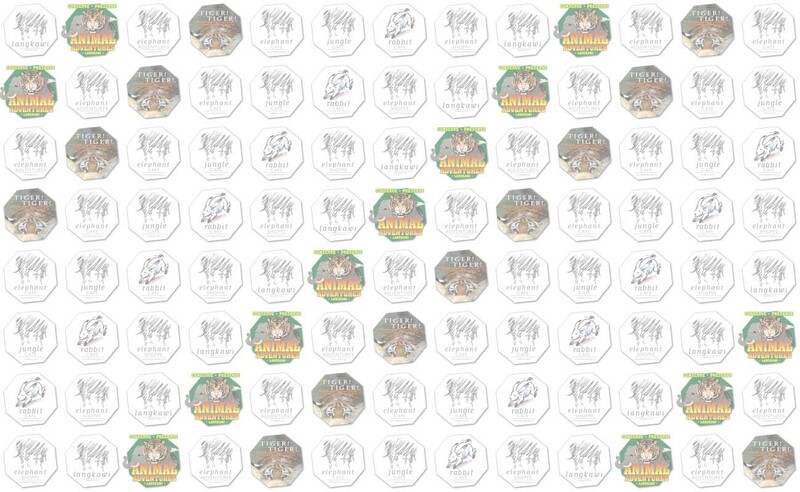 Public Preview promotions will run through December 31, 2015.